Racing legend Sir Jack Brabham has passed away at the age of 88. Although best known for his three Formula 1 world championships and, of course, as the first (and probably only) man ever to win an F1 title in a car bearing his own name, Brabham was also a notable winner in the BTCC. Back in the sixties, many of the top F1 drivers of the era raced in saloon cars on their ‘free’ weekends away from grand prix action. Indeed, the great Jim Clark actually won the BTCC crown outright exactly 50 years ago – an anniversary that will be celebrated later this season at Knockhill. Brabham was also a BTCC winner in 1964, triumphing at a rather sodden Snetterton racing one of the mighty American 7.0-litre Ford Galaxies. Jack Sears in another of the Galaxies lead the opening exchanges but then collided with a spinning back marker. With Sears sidelined, Brabham sailed home to take what was his second BTCC race victory with the giant-killing Clark a fine second in his Lotus Cortina and Gawaine Baille third in another of the thundering ‘Yank Tanks’. The wide open spaces of Snetterton must have been a real favourite of Sir Jack’s as his maiden BTCC win also came at the Norfolk circuit – again in a Galaxy – at the tail end of 1963. He won there again – this time in a Ford Mustang – in 1966, too. 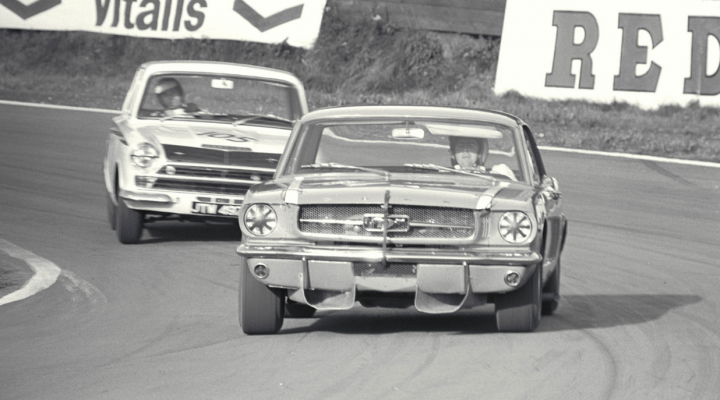 The Australian’s other win also came in a Mustang at Brands Hatch in 1965. As well as all of his incredible on-track successes, Brabham also spawned a motor sport dynasty with his three sons Geoff, Gary and David all following in their father’s wheeltracks. David competed in the BTCC for BMW in 1995 and, earlier this month his son Sam – Sir Jack’s grandson – scored his debut win in the single-seater Formula Ford Championship on the BTCC support race bill. The BTCC honours one of its past winners and sends its heartfelt condolences to Sir Jack’s widow Lady Margaret and the entire Brabham family.